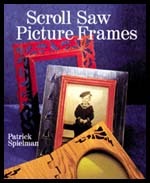 Another excellent Scroll Saw pattern book from the most prolific scroll saw author known today, Patrick Spielman. This book contains 32 new designs for picture frames and no two use the same technique to cut or assemble. This book is much more than a book of patterns, it is a veritable reference to different scrolling techniques demonstrated in what might be their simplest form. The technique that I found most interesting was the Mitered fretwork. To explain, I scroll a lot, but I am not a woodworker. So some things that might seem elementary to woodworkers can be very daunting to me. This technique was explained in such a manner that I can't wait to use it. If I can get this to work for me, then no longer will I have to depend on my woodworking husband to stop what he is doing in order to miter some pieces for me. Both of us will be much happier that way. In addition to the scrolling techniques, the book also contains a pretty good list of finishing techniques. Using these methods on a picture frame can build confidence to tackle other projects using the same techniques. At least three different techniques for making a stand for picture frames are also explained. This includes creating a metal base for a flexible stand, wooden pegs, an easel, and all the way up to a book end stand. The possibilities of carrying these techniques over into other projects is only limited by your imagination. There is also a very good introduction to scrollsaws, and basic scrolling . Including one of the hardest things to do with a scroll saw, how to cut a straight line. An important skill in making a good picture frame, but as Pat has demonstrated, you can still make a very nice picture frame without a straight line in the project. So, until you have mastered straight line cutting, there are still a lot of good ideas in here for projects. If the idea of making picture frames is still a challenge for you, Pat has also included some patterns for Christmas ornaments and Kitchen magnets using a lot of the above techniques. So you can practice on something much smaller and then move up to the "big" project of a picture frame. I would recommend this book for the beginner scroller, and for the beginning woodworker like myself. An experienced woodworker would have to check out the patterns themselves to see if they were of interest to them. But the techniques explained would probably be pretty elementary to them and not very interesting. We all have a shoe box of pictures laying around the house. Wouldn't it be nice to be able to put them to use in presents? Or if you are scrolling for the craft market, I think your customers probably all have a shoe box of pictures laying around also. This book could be just what you need to get you going cleaning out a few of those old pictures. Sterling Publishing has graciously donated several books for review which are passed on to our members free of charge. Thank You!